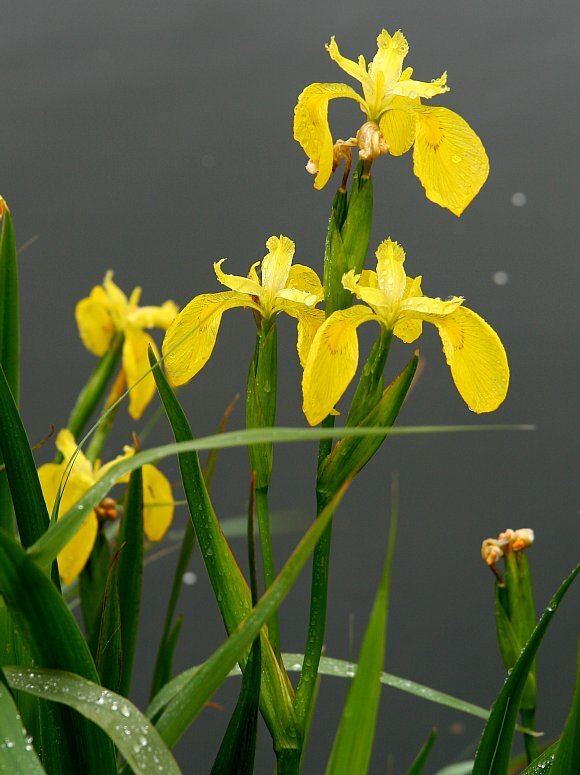 Always grows in shallow water such as canal sides and on slow-flowing freshwater streams, or on marshes. 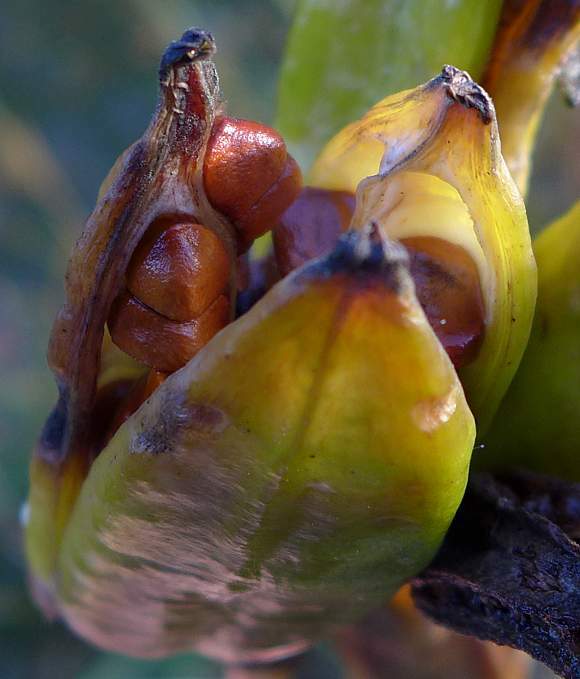 Grows 0.8 to 1.5m tall, these specimens at the taller end of the range. 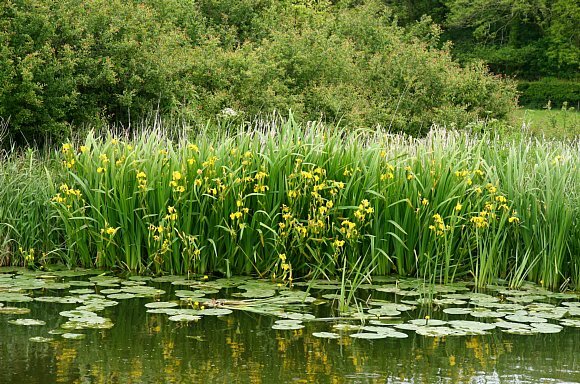 Leaves very long and linear, similar to those of Montbretia, Great Reedmace and Branched Bur-Reed here growing in damp ground where water collects over winter. Short wide leaves sheath of the stem at intervals, especially where the stem branches. 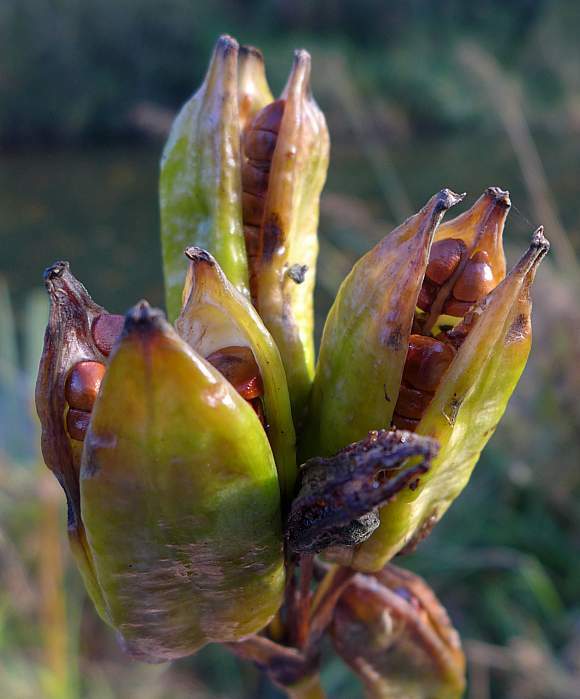 New flower-buds yet to open are spiked a little like Yellow-wort (Blackstonia perfoliata) but much taller. The six petals are tightly wrapped up, the three outer are tepals, the as-yet unseen three inner are petals. The tepals are larger than the petals and droop downwards. Showing the outer tepals which hang down and the inner petals. The outer tepals have reddish lines marked upon the upper surface whereas the shorter petals have reddish striations on the underside only. The outer petals are heavily veined in red. 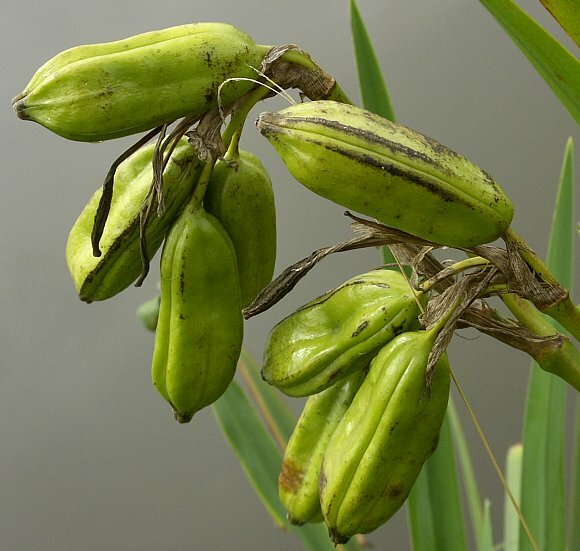 Large 3-sided green seed pods replace the flowers. 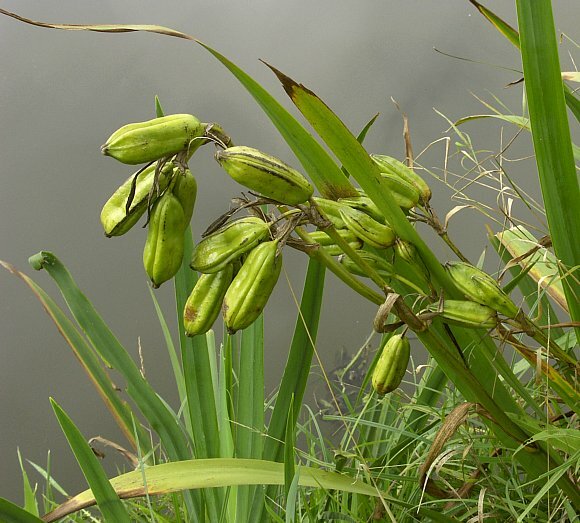 They contain many brown seeds which float on water to germinate in the vicinity. 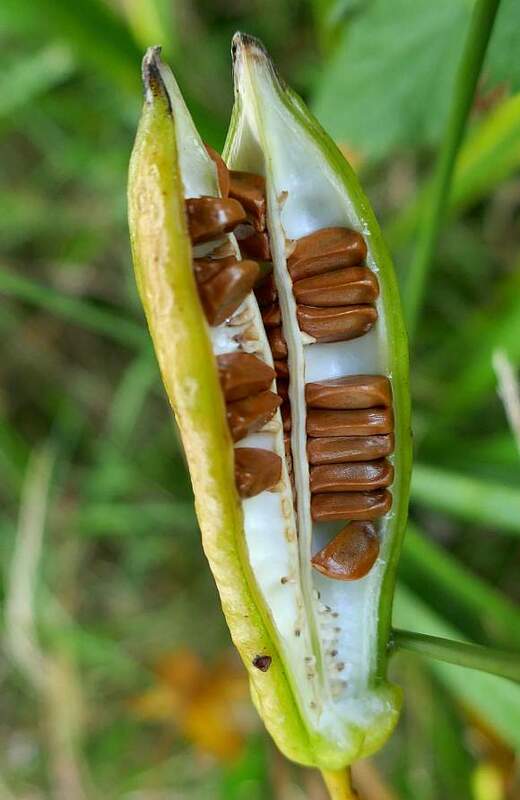 The seeds within the pods. 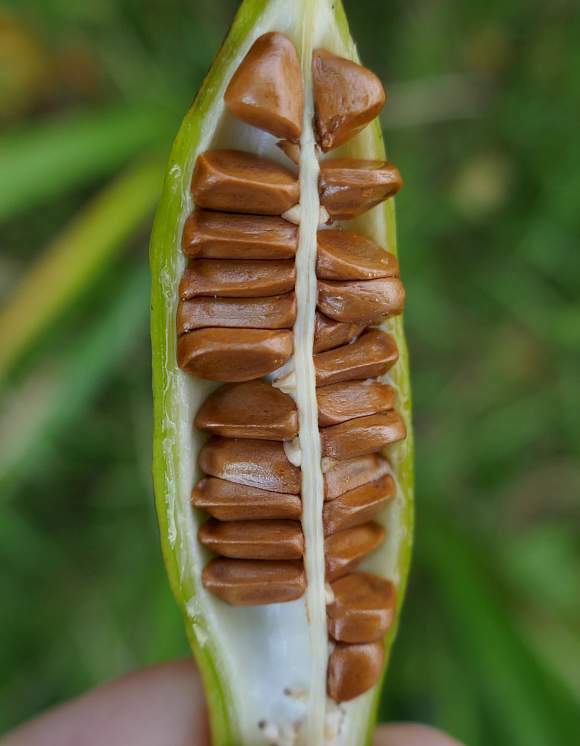 When fully ripe the three pod sides splay wide open like an out-stretched palm. Split open manually so that your Author could better photograph the seeds, which then mostly proceeded to fell out. Opening another pod. The seeds are milk chocolate-brown and vary in shape, but most have at least two flat sides in order to pack in side by side, in two rows. The seeds in close-up. They are quite unlike those of the otherwise similar (but with a pale mauve coloured flower) Stinking Iris which has bright-red roughly spherical seeds in the pod which look like berries. The long stiff, broad sword-shaped leaves have parallel veins and are finely ridged. 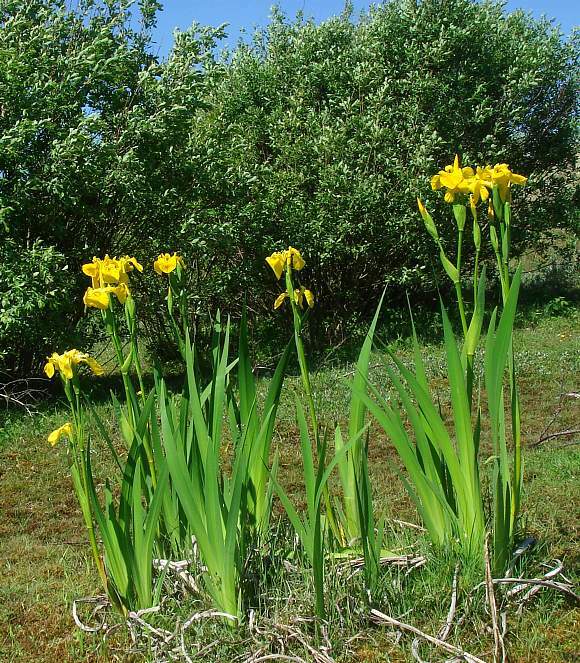 Some similarities to : Daffodil s, but daffodils don't grow in water or have three large petals flopping down. Uniquely identifiable characteristics: There is no other plant quite like this. 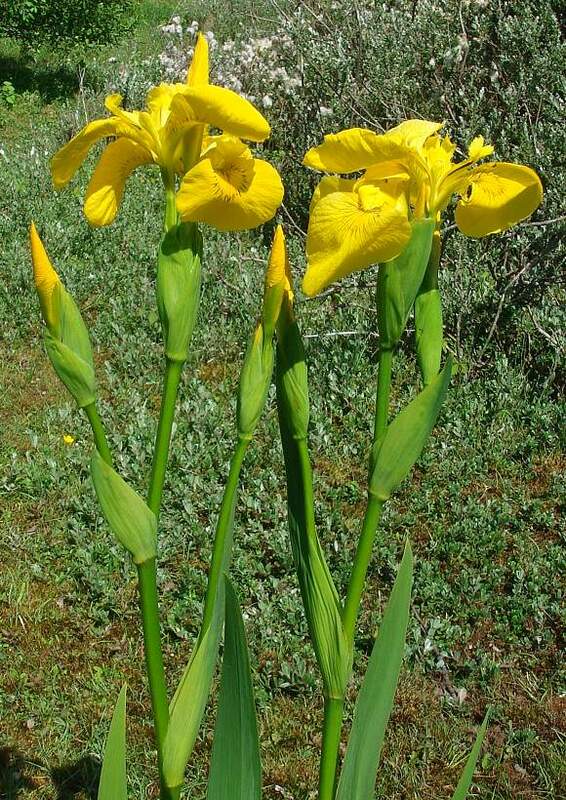 Distinguishing Feature : The large yellow petals in triplets at 120 degrees. Always grows in water. Like many aquatic plants, this too has petals in three's. 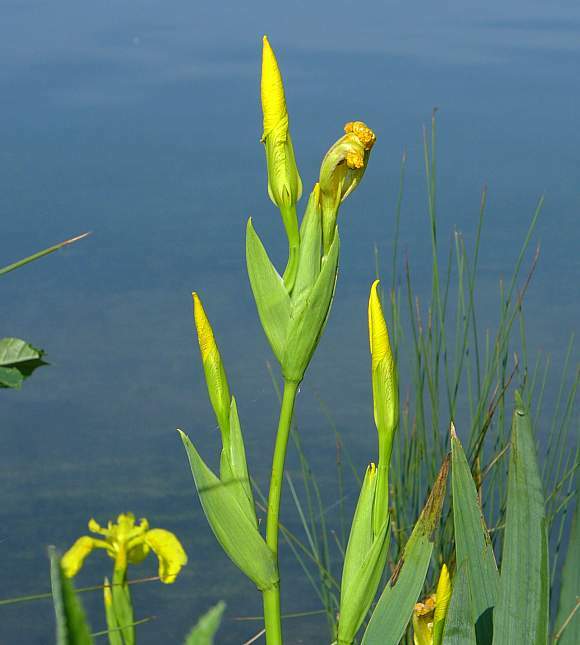 The poisonous cardiac glycoside Iridin (aka Irisin) is found in the leaves and rhizomes of Yellow Iris. If ingested symptoms include nausea, elevated temperature, vomiting, abdominal pain, severe purgation can result. It is dangerous to animals. 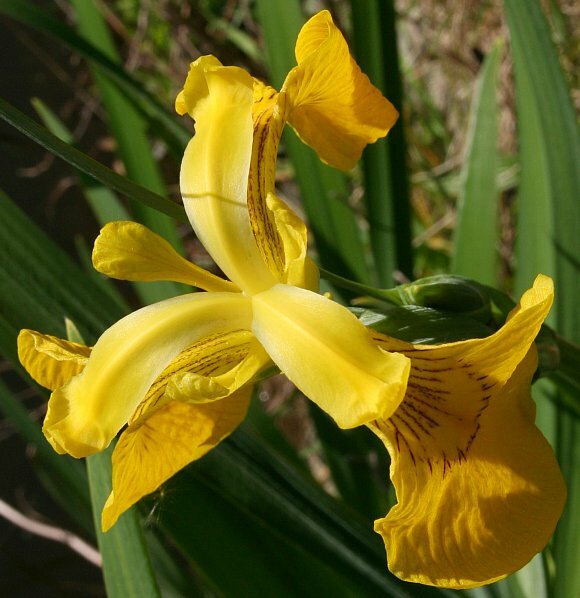 Most irises contain this substance. 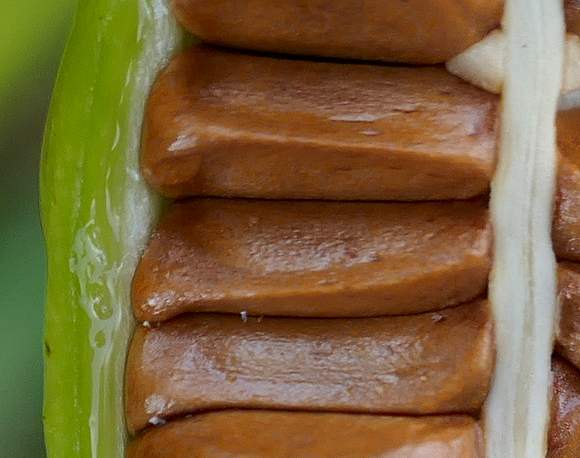 It is also found in the roots of the Violet Family. 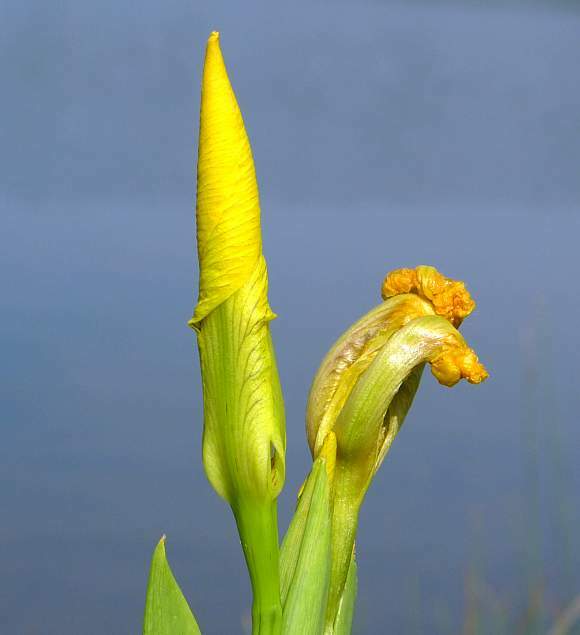 Yellow Iris spreads underwater by thick rhizomes in anoxic conditions, and is able to withstand quite acidic conditions (low pH). 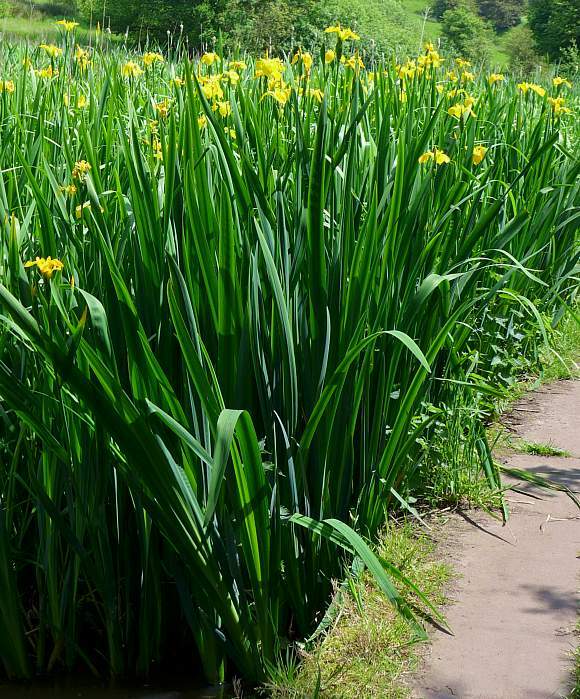 It is selectively absorbs heavy metals and has been used to help clean up heavy metal pollution, provided that pollution occurs in water, for Yellow Iris needs wet conditions and will not grow on dry land. The rhizomes were used to produce both a black dye and an ink. 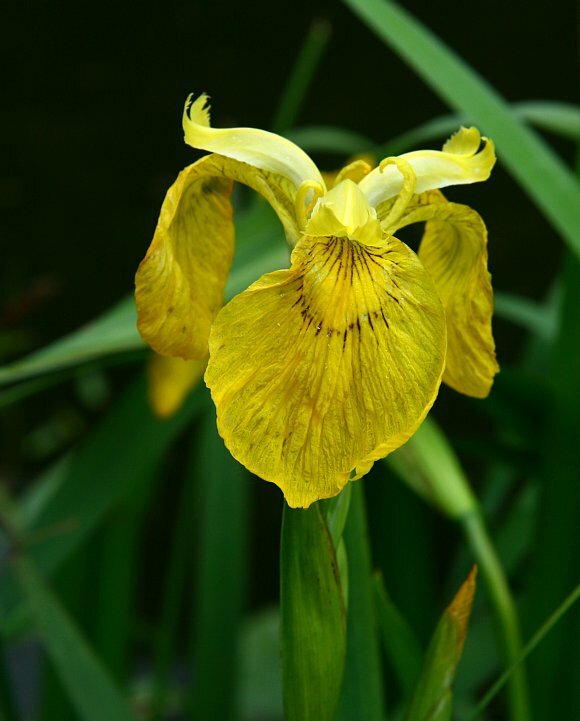 Yellow Flag is a perennial with stout stems and an under-ground horizontal tuber. It is poisonous. 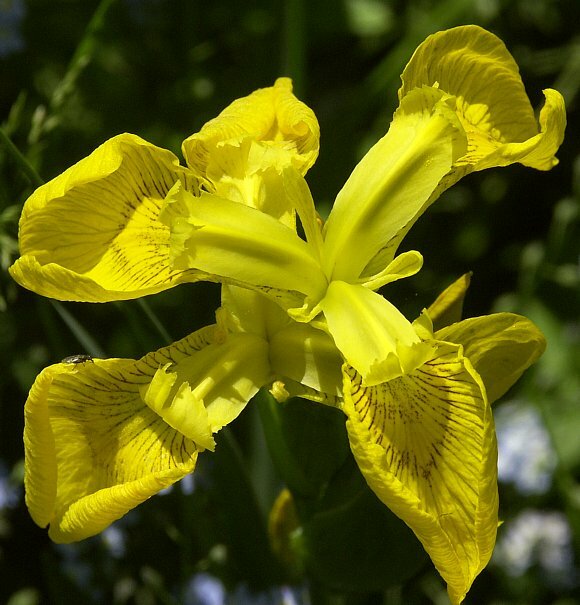 Irisquinone is an contact allergen found in Yellow Flag, which is very similar to one of the quinones (Primin) found in species of Primrose, some species of which are notoriously allergenic, causing contact dermatitis. Compare with GeranylGeranyl-Benzoquinone and other benzoquinones with long aliphatic side chains.